Arianespace has successfully launched two Earth observation satellites for civil and military applications: OPTSAT-3000 for the Italian Ministry of Defence; and Venµs, a mission of the Israel Space Agency (ISA) – a government body sponsored by the country’s Ministry of Science & Technology – and the French CNES space agency (Centre National d’Etudes Spatiales). The launch took place on Tuesday, August 1, 2017 at 10:58:33 pm (local time in Kourou) from the Guiana Space Center (CSG), Europe’s Spaceport in French Guiana. This was Arianespace’s eighth mission of the year and the second using Vega in 2017. It marked the 10th successful Vega launch in a row since this light-lift vehicle started its career at the Guiana Space Center in 2012. Additionally, today’s mission reaffirmed Vega’s excellence and versatility. As a highly versatile launcher, Vega has now logged 10 launches, all successful, since starting operation in 2012 at the Guiana Space Center. Over the past five years of launch activity, Vega has orbited a total of 25 satellites for 19 customers, both government and commercial. In June 2017, Arianespace announced the first two contracts for the Vega C launcher. Scheduled to make its first flight in 2019, Vega C will offer higher performance than the current version in terms of payload weight and usable volume. It will be able to handle an even wider range of missions (from nanosatellites to large optical and radar observation satellites), and will further enhance the launch service competitiveness. Vega and Vega C now have an order book totaling nine launches, with one-third of them for European governments and two-thirds for commercial customers in export markets. This mission also marks Arianespace’s continued focus on innovation, heralding the new payload fairings to be used on its upcoming Ariane 6 and Vega C launchers. As with the most recent Ariane 5 mission (on June 28, 2017), the new “out of autoclave” fairing, built by RUAG, protected the satellite passengers on Flight VV10. On this VV10 mission, Arianespace also anticipated the evolution for how Vega launch campaigns are carried out, based on the framework agreement defining the operational organization for Ariane 6 and Vega C, which was approved by ESA, CNES, ArianeGroup and Avio. Industrial prime contractor Avio now assumes responsibility for preparing the launcher until its liftoff (H0), while Arianespace maintains full responsibility for customer relations, as well as operations for the final countdown and the launch decision. This new operational organization is to allow more integrated operation of teams at the Guiana Space Center for enhanced competitiveness. Seven Vega launches in the order book, along with two Vega C launches. OPTSAT-3000 is the fourth satellite launched by Arianespace for the Italian Ministry of Defence since 2001. This Earth observation satellite will enable the acquisition and use of high-resolution images from any part of the globe. The OPTSAT-3000 system will be interoperable with Italy’s second-generation COSMO-SkyMed radar satellites. This will give the Italian Ministry of Defence access to state-of-the-art technologies, and ensure maximum operational capabilities with the combined optical and radar data offered by these two systems. Telespazio is responsible for the entire system, with OHB Italia in charge of launch services and related engineering support. Venµs is an Earth and vegetation observation and exploratory mission, designed to monitor the effects of climate change. This mission is part of a joint space program between the Israel Space Agency (ISA), a government body sponsored by the country’s Ministry of Science and Technology, and the French CNES space agency (Centre National d’Etudes Spatiales). In fact, the full name of the satellite summarizes its mission: “Vegetation and Environment monitoring on a New MicroSatellite.” By analyzing and comparing images of the same area at different times, researchers can evaluate soil conditions, understand the development of vegetation, and detect the outbreak of a disease or the contamination of a field. The two satellites for this mission are the 62nd and 63rd Earth observation satellites launched by Arianespace’s Ariane, Soyuz and Vega launchers. Arianespace is a key player at the service of European institutions (both agencies and governments) for their Earth observation and meteorology programs. Israel Aerospace Industries Ltd (IAI) built both OPTSAT-3000 and Venµs, which are the third and fourth satellites from this manufacturer to be launched by Arianespace, following Amos 1 (in May 1996) and Amos 2 (in December 2003, via Arianespace’s Starsem affiliate). IAI is the largest aerospace and defense company in Israel. Shortly after the announcement of the orbital injection of these two satellites, Arianespace Chief Executive Officer Stéphane Israël said: “With this second Vega launch of 2017, and its 10th success in a row since being introduced at the Guiana Space Center, Arianespace is very proud to support two major Earth observation programs for Italy, Israel and France. We are very honored by this mark of trust from the Italian Ministry of Defence for which this launch – via our direct customer OHB Italia and on behalf of Telespazio – marks the fourth by Arianespace since 2001. 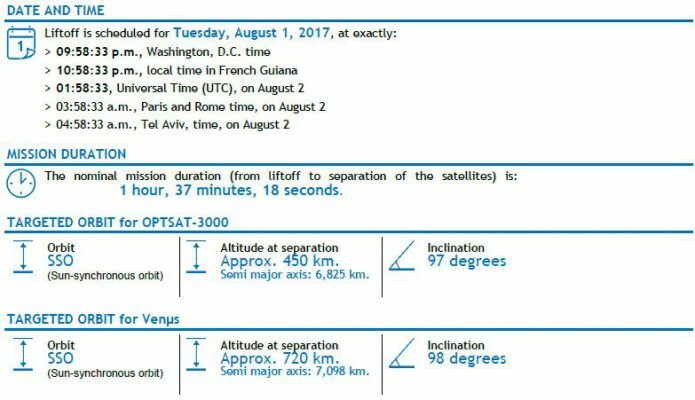 Concerning Venµs, thanks go to the Israel’s Ministry of Science and Technology (MOST), which entrusted us with this symbolic mission at the service of the environment, conducted by the Israel Space Agency (ASI) and the Centre National d’Etudes Spatiales (CNES). Equally, ‘bravo’ to Israel Aerospace Industries, which built both satellites: OPTSAT-3000 and Venµs. The OPTSAT-3000 passenger is a very-high-resolution optical Earth observation satellite that will provide daytime images of the entire planet. It was placed into Sun-synchronous orbit at an altitude of about 450 km. With a mass of 368 kg. at launch, OPTSAT-3000 offers a design life of 7 years. The Venµs payload is a high-resolution, high-frequency Earth observation satellite, which will produce high spatial and temporal resolution images. It is equipped with a camera built by Elbit Electro-Optic Systems Elop Ltd for CNES. The satellite was placed into a Sun-synchronous orbit at an altitude of about 720 km. It weighed 264 kg. at launch and offers a design life of 4.5 years. Both OPTSAT-3000 and Venµs were built by Israel Aerospace Industries in Tel Aviv, Israel, using an IMPS Bus platform.